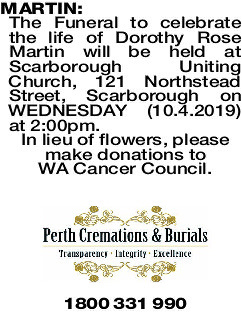 The Funeral to celebrate the life of Dorothy Rose Martin will be held at Scarborough Uniting Church, 121 Northstead Street, Scarborough on WEDNESDAY (10.4.2019) at 2:00pm. In lieu of flowers, please make donations to WA Cancer Council. Aged 87. 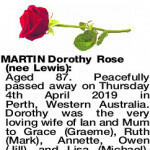 Peacefully passed away on Thursday 4th April 2019 in Perth, Western Australia. 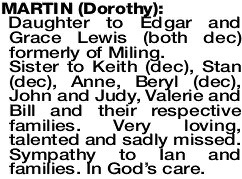 Dorothy was the very loving wife of Ian and Mum to Grace (Graeme), Ruth (Mark), Annette, Owen (Jill), and Lisa (Michael). 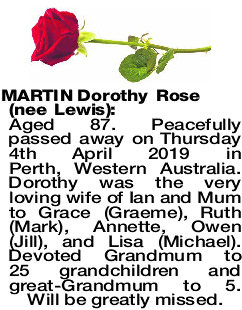 Devoted Grandmum to 25 grandchildren and great-Grandmum to 5. Will be greatly missed. Daughter to Edgar and Grace Lewis (both dec) formerly of Miling. 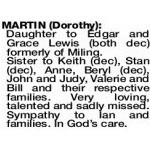 Sister to Keith (dec), Stan (dec), Anne, Beryl (dec), John and Judy, Valerie and Bill and their respective families. Very loving, talented and sadly missed. Sympathy to Ian and families. In God's care.